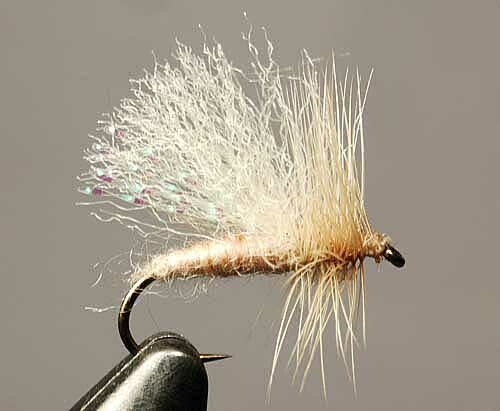 ...high floating, easy-to-spot on the water, and known to move tough trout. The following flies are Skip's original designs. The sample flies in the photographs were tied by Solitude. 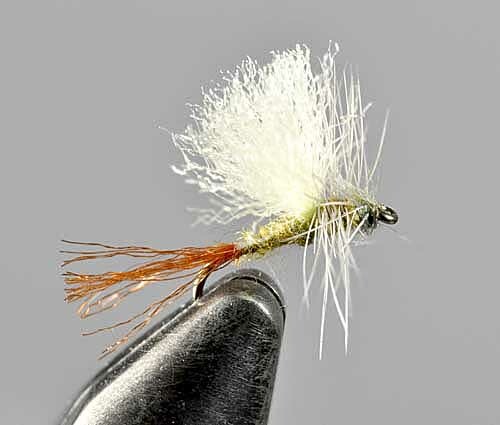 These light, simple dry-fly imitations fool wary trout. The different variations imitate specific mayflies. All versions have bright, easy-to-spot wings. Skip's trusted the Morris Mays for a couple of decades. This dry fly imitates the little blue-winged olive(BWO) or Baetis mayfly dun so common across North American rivers in the fall, winter, and early spring. 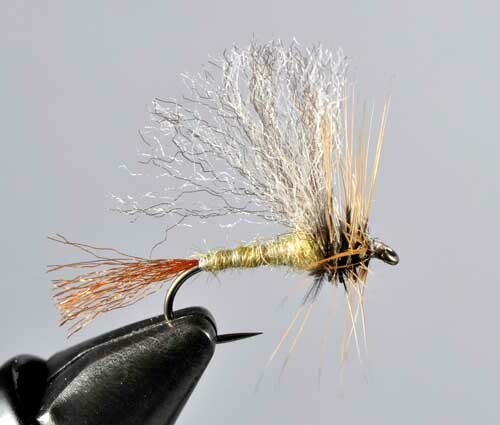 This dry fly imitates that late-winter mayfly of western rivers. This dry fly imitates the pale morning dun mayfly that provides steady hatches through the regular season on western rivers. 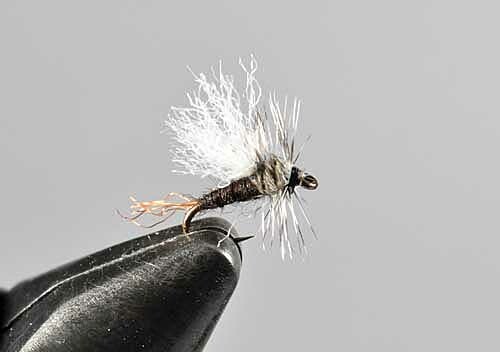 This dry fly imitates the tiny Tricorythodes or trico mayfly dun that hatches on the smooth sections of rivers all across North America in August and September. 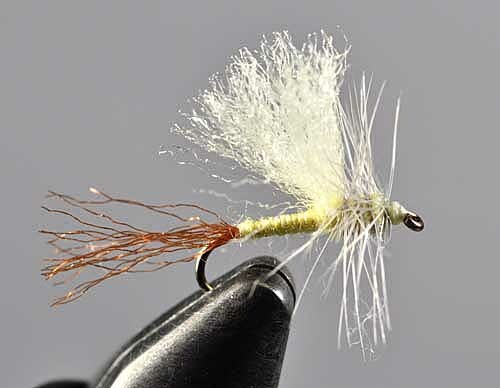 The Skaddises are tough, effective even for wizened trout feeding in clear smooth water, and, for caddis imitations that settle their bodies to the water's surface like real caddisflies, good floaters. 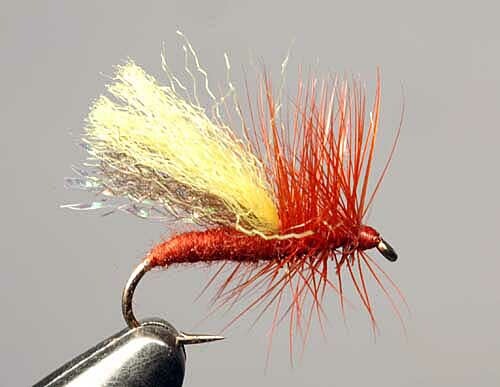 Simple as they are, the Skaddises create a convincing effect trout like. Between the light and dark versions you can cover a lot of caddis. Effective for hatches of little stoneflies too. Imitates all sorts of darkish caddis. Thanks to the yellow topping on the wing, up where the fish can't see it, this one is easy to see on the water. Imitates all sorts of pale caddisflies. Easy to see. These are not only durable but practically unsinkable! And they offer trout a clean, convincing outline of the two giant western stoneflies of rivers: the salmonfly and the golden stonefly. Both hatch in late spring to summer with the goldens following on the heels of the salmonflies. Exciting stuff! 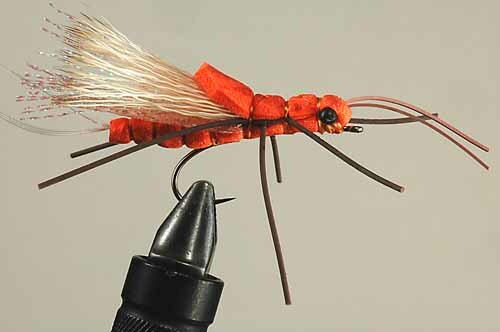 Imitates the biggest stonefly in North American rivers: the giant salmonfly. 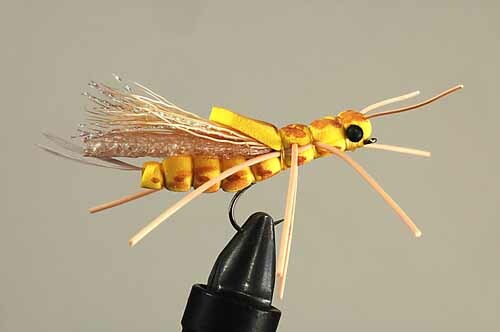 Imitates the second biggest stonefly in North American rivers: the golden stonefly.